Our trip to Racine, Wisconsin went well. We caught up with old friends, eating at our favorite restaurants and playing at the kids’ favorite park. I preached and we taught Sunday school at Fellowship Baptist Church. On Sunday evening, Fellowship hosted a book talk, and I was delighted to see many old friends there and meet several people who have been touched by our story. 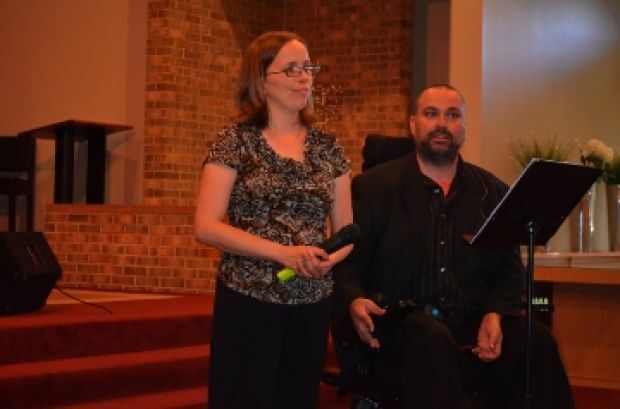 Former West Racine residents Kristin and Todd Neva, who now live in the Upper Peninsula of Michigan, talk Sunday night at Fellowship Baptist Church, 5607 Wright Ave., about the book they wrote about dealing with Todd Neva’s terminal illness, ALS. RACINE — It’s the pain that Todd Neva says he feels for the people in his life who love him, and will be left behind when he dies, that visibly affects him. “I have yet to teach (my son) how to be a man, how to ride his bike, how to treat a woman,” Neva said Sunday while discussing a book he and his wife wrote about how to deal with a terminal diagnosis and find meaning in what remains of their life together. “I have yet to walk (my daughter) down the aisle at her wedding. My girl needs her dad,” he said. Todd Neva was 39 years old when he was diagnosed in June 2010 with… continue reading. This entry was posted in Uncategorized on July 9, 2014 by Todd Neva.